Dare is a coral shade. It's very pretty with some shimmery browns/bronze along with the coral shade in it. Very pigmented and gives a very pretty glow on my face. Rosey is a medium pink shade. There's a light pink, rosey pink, purple shades in the compact. The overall turnout is really just a vibrant rosey pink shade, which I find it a bit hard to wear. It can turn out to be quite loud when you overdo it. Would probably try using the colours separately as blush. You would need a smaller brush as the compact looks big in the picture but in real life, you would find it to be smaller and harder to just dab on single shade. 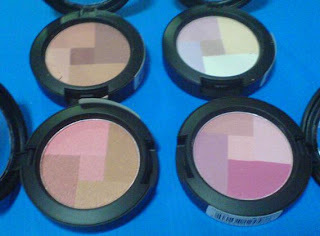 For the two mosaic blushes above, they will just turnout like the top rightmost shades. Peachy contains shades like a beige, peach, brown, bronze as illustrated in the photo. The turnout is just a natural flush on the face, which I would say is good for everyday when you don't feel like wearing pink/peach/red cheeks. Overall, the NYX Mosaic Powders did not disappoint. The blushes look smaller in real life as compared to pictures you see online. I'm not sure why. It could be the mosaic prints playing tricks on the eyes. These are pigmented, but they are also very powdery so it can be a mess after swirling to get a good mix. Some people find it chalky but I don't really think so. Like I've said earlier, you can try using a smaller blush brush to use the shades separately. Haven't really done that so I can't review. Peach is a very pretty peachy pink. I read it off another blog that it is recommended for Asian ladies so I had to get it. It is such a pretty colour. It's like the most perfect peachy pink I've seen. I like this a lot for it really gives me a nice glow. Overall, the NYX powder blushes did not disappoint too. They are very pigmented and also very powdery. 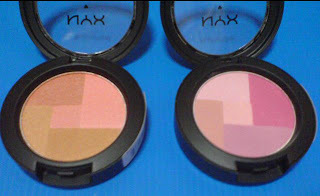 They are definitely not chalky compared to the NYX Mosaic blushes. As I don't like my blush to show up very obviously, I don't really need to use a lot. I love both colours in the compacts although only Peach suited me better. They look really gorgeous. I'm lemming for more shades from this range. I bought this with the intention of using this as a cream blush base to make my powder blushes stay longer. Haven't tried it that way yet. 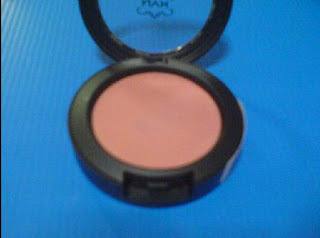 NYX Rouge Cream Blush in Rose Petal is the lightest shade in the range so I picked it up. I thought it would be a soft earthy pink, like a rose petal shade. But when swatched, it's just pink. The shade wasn't that bad but it was not what I pictured. When applied on the cheeks, it's very easy to blend and colour is buildable. That's a plus point for me for it's so easy to use. It's something that wouldn't go wrong since you can pile it sheer and build it up another layer if you want a more intense colour. Super easy to use. If you haven't tried these blushes, what are you waiting for? For their pigmentation level and the price you pay, it's very value for money. Get these if you are ok with powdery blushes that might be a mess. 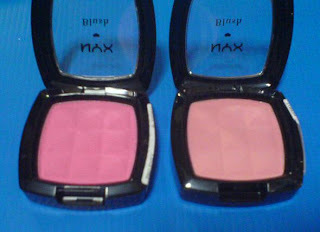 For swatches of the NYX Powder Blushes, you can check this site.